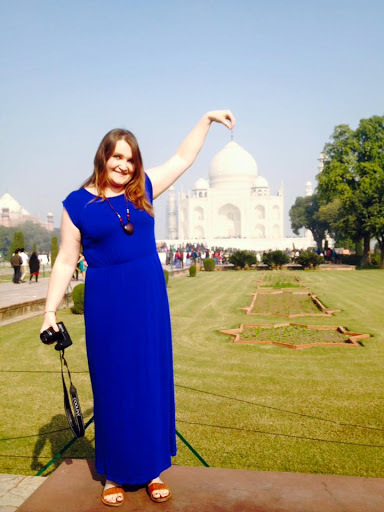 Meeting the Taj Mahal – Where's Clair? It was almost like getting ready for a date. I had chosen my favourite cobalt blue dress and taken my time over my make up. It was actually the only day I had worn make up in India so far. 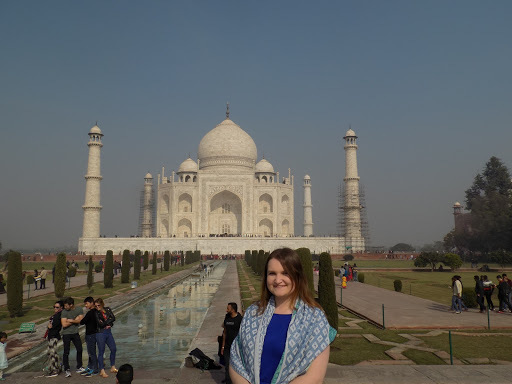 Today was a very special day, I was going to see the Taj Mahal and I had this odd feeling that I needed to look my best. I could barely eat breakfast I was so excited, opting instead for a fresh mango lassi. I felt giddy as we arrived in the car park. Polluting traffic is not allowed near the Complex, so we hustled onto the electric bus which would bring us to the entry gates. There were so many of us that I had to sit up the front beside the bus driver, and there were lots of people standing, but no one seemed to mind. As we had prepaid for our tickets we whisked past the queues and through security. I had been warned to be mindful of pickpockets in the complex, so I had only brought the essentials. We walked through a cobble-stoned courtyard before arriving at the grand archways which gave us our first glimpse of ‘Taj’. Even through the hoards of fellow tourists (It is estimated that 7-8 million visitors come each year) I could see the majestic marble dome and lotus design which immediately let me know “I’m here”. We slowly and calmly moved closer until full grace and beauty was apparent. If this had been at date, it would have been love at first site. They say that the tomb looks pinkish in the morning and golden at night, but at this moment it was milky white against the backdrop of the light blue sky. The perfection of this incredible building was reflected and enhanced by the pool leading the way. On this morning, the right front and left back minarets were surrounded by subtle scaffolding, but I din’t even notice until it was pointed out by our guide. We sat on marble benches while we learnt the story of Shah Jahan and how this magnificent structure is a testament of his love for his wife Mumtaz Mahal. We stopped to take some playful photos before entering the tomb itself. We placed plastic covers on our shoes before entering the main tomb and unfortunately we didn’t have the time or space to fully appreciate the splendor of the internal decoration. There were so many people inside the tomb that we had to move quickly and anticlockwise and so I didn’t manage to fully take in the intricate flower motifs carved into the marble and laced with semiprecious gemstones. 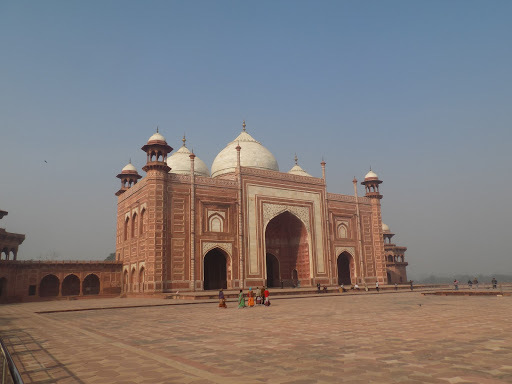 To the very centre of the tomb lies Mumtaz’s cenotaph, with Shah Jahan’s placed at the western side. This is the only non- symmetrical aspect of the entire complex. Such care was taken in the building of the Taj Mahal, that it is completely symmetrical and it looks identical from the back and the front. To the side lie two red sandstone buildings parallel and identical to each other. The building to the west is a Mosque, while the building to the east is thought to have been built for symmetry, but may have been a guest house. I wandered around the complex and it’s gardens which seemed so spiritual despite the huge number of visitors. I sat watching love birds and taking in the atmosphere of the place. I wanted to remember every moment of this day. I had set myself the lifetime goal of visiting all seven of the New wonders of the World and here I was at number two. 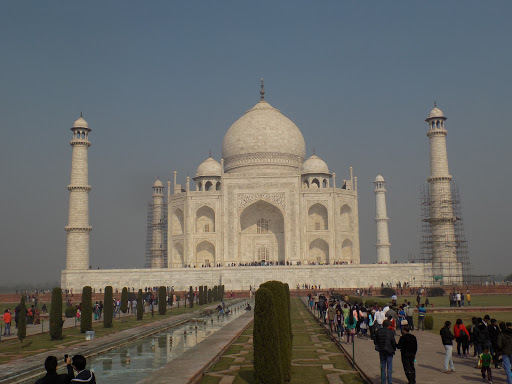 I felt so honoured to have been able to experience the beauty and the grandeur of Taj Mahal for myself. 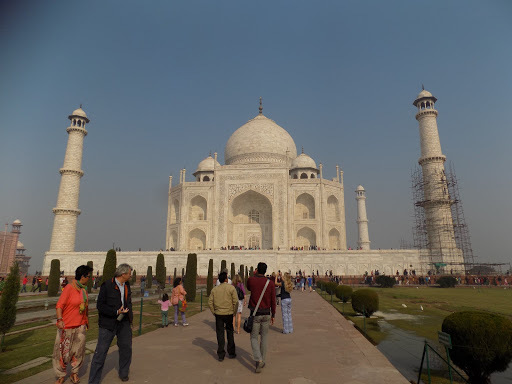 Finally is was time to leave and our guide told us that if we looked over our shoulder as we left, we would someday visit the Taj Mahal again. I did this, because although I had this amazing experience, I would like to share it with someone in the future. 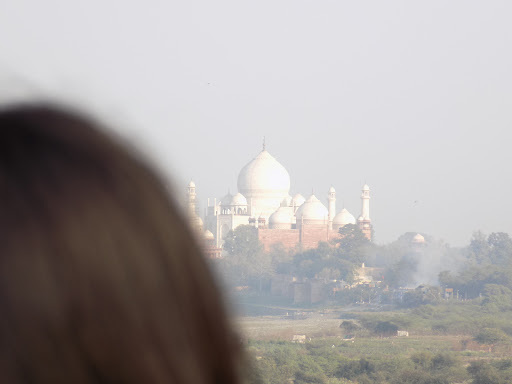 Little did I know, that I would see Taj Mahal later that same day from the glorious Agra Fort. Another World wonder ticked off my list. I left feeling so fulfilled. If I had to fly home the next day I wouldn’t have minded at all. Clearly, I had no idea what other wonders India had in store for me. And so my journey continues……. 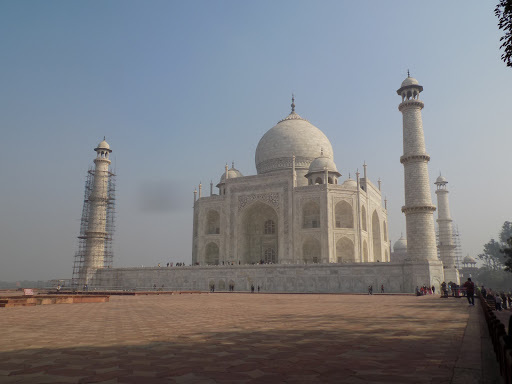 I have been wanting to see the Taj Majal. Lucky you! Hopefully I get to go soon. What beautiful photos! 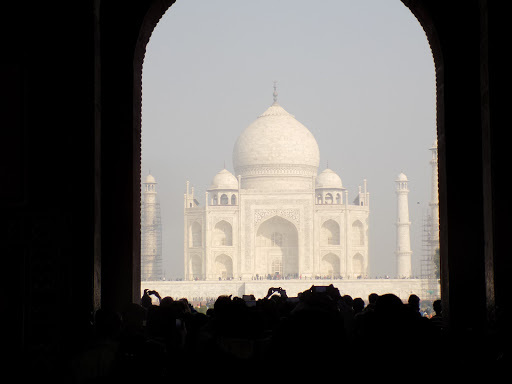 You are so lucky to visit the Taj Mahal. You can see how much the Shah must have loved his wife to build such a gorgeous monument to his feelings. And I love that red mosque too! I've never seen photos of that before.